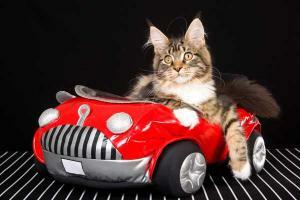 A car mechanic has had a shock after lifting the bonnet of broken down vehicle and finding a cat underneath. The unnamed car owner pulled over after hearing strange sounds coming out of the engine. Assuming there was a fault with the vehicle she called the AA and mechanic Max Holdstock arrived on the scene only to discover it was a 10-week-old tortoiseshell cat. Mechanics and garages can get all sorts of surprises when repairing cars, with animals often attracted to the warmth of the engine. However, some shocks can be less pleasant and this is why road risks insurance and motor trade insurance policies are so valuable - they can provide cover for customers' cars being driven by staff as well as protection for a business' stock, parts, employees and trading premises against accidental or malicious damage and theft. According to the Plymouth Herald, the driver was heading from Cornwall to London, and had travelled 220 miles before she stopped the car in Staines, Surrey. After Mr Holdstock identified the four-legged caused of the problem the feline was taken to Willet House Vets where it was given a clean bill of health. The vet is now looking to find the cat's owner. As it is not chipped, they decided the put an advert appealing for the cat's owner to come forward on social media - the vets have since been inundated with phone calls from people claiming it is theirs.